Theaster Gates became known for the Dorchester Projects, a series of vacant buildings in Chicago that he renovated and rehabilitated with a team of young architects and designers, and which now offer space for performances, and other cultural events. Theaster Gates' subject matter is construction and transformations, urban regeneration and the reversal of power relations. Black Archive at the Kunsthaus Bregenz in Bregenz, Austria, is Theaster Gates' first institutional solo exhibition in Europe. In this video, we take a look at the exhibition on the occasion of the opening reception of the show. Theaster Gates was born in 1973 in Chicago, where he lives and works. He has exhibited widely, including group shows such as Saltwater, 14th Istanbul Biennial (2015), the Whitney Biennial, New York (2010), dOCUMENTA (13), Kassel (2012), The Spirit of Utopia at the Whitechapel, London (2013), and Studio Museum's When Stars Collide in New York (2014). In 2015 he was a participant in the Venice Biennale. 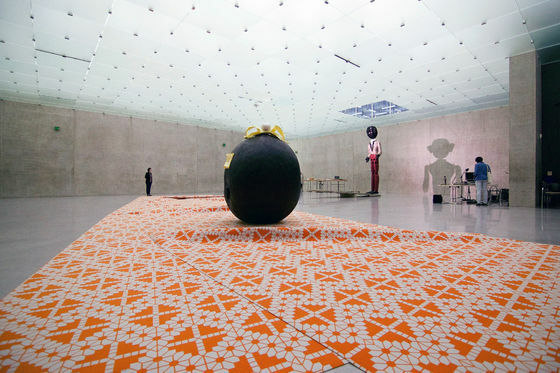 Major solo exhibitions include To Speculate Darkly: Theaster Gates and Dave, the Slave Potter at Milwaukee Art Museum (2010), Theaster Gates: The Listening Room at Seattle Art Museum (2011/2012), and Theaster Gates: 13th Ballad at MCA Chicago (2013), as well as The Black Monastic residency at Museu Serralves, Porto (2014).